Three journalists accused of helping a terrorist group were refused bail when they appeared in court yesterday for the first time after two months in prison in Egypt. The Australian Peter Greste shouted from the caged dock "I love my family. I'm strong. We know we have done nothing wrong. We have confidence that justice will set us free." He added: "The physical conditions are good, but I'm drained." His co-accused Egyptian-Canadian Mohammed Fahmy called out that imprisonment was physically fine, but psychologically unbearable. Greste 's parents said after the hearing that he had managed to get out a message to say that public support was vital to their case and that it was protecting them while they were in prison. 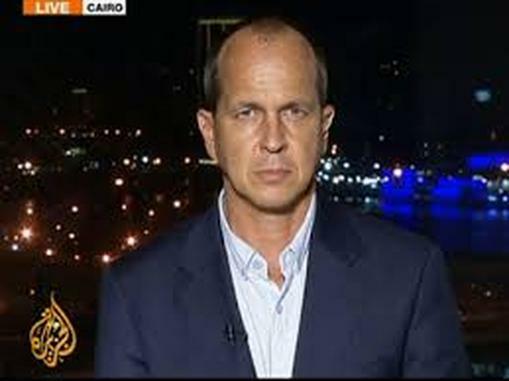 Greste, 48, Fahmy and Baher Mohamed, who all work for Al-Jazeera English, were arrested in December along with 17 other staff from the TV station after Egypt declared the Muslim Brotherhood a terrorist organisation. Abdullah Al Shami, of Al-Jazeera Arabic, had been arrested in August and is reported to be in the third week of a hunger strike. Prosecutors allege that Al-Jazeera is biased towards the Brotherhood and the ousted President Morsi- which it denies. They accuse the journalists of helping the organisation by manipulating pictures to give the impression to the outside world that there is a civil war in Egypt that threatens to bring down the state. Michelle Stanistreet, the NUJ general secretary, and the Labour MP Jeremy Corbyn had a half-hour meeting with the Ambassador in London on Wednesday to protest about the arrests and demonstrations have been held outside the embassy. statement saying: "Egyptian authorities have demonstrated almost zero tolerance for any form of dissent, arresting and prosecuting journalists, demonstrators and academics for peacefully expressing their views.” The organisation's Middle East deputy director Joe Stork said: "Journalists should not have to risk years in an Egyptian jail for doing their job." The Australian Prime Minister Tony Abbott said: "Obviously a free press is not compatible with harassing journalists going about their ordinary business."